Thank you for another successful event!!! 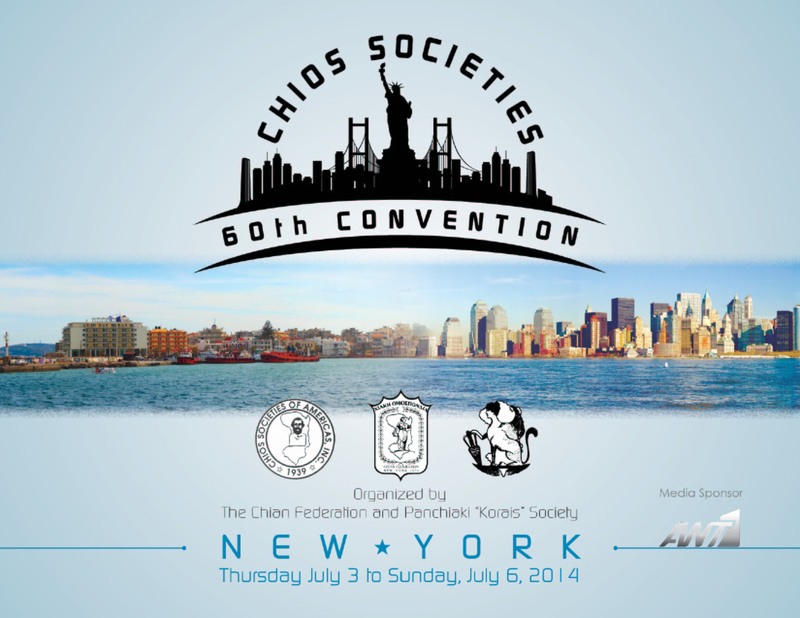 To celebrate the 100th Anniversary of the Liberation of Chios from Ottoman Turk Rule, the Eleftheria Centennial Committee of the Chian Federation of New York is sponsoring a National Essay Contest and cordially invites the participation of all High School, College, and Graduate students. Please click here to the Rules and Guidelines for the Eleftheria Centennial National Contest. In the event that there is a need for any clarifications please contact the Eleftheria Centennial National Essay Contest Committee by email to chianfed @ chianfed.org, att: Eleftheria Centennial National Essay Contest Committee, or by telephone, 718-204-2550. 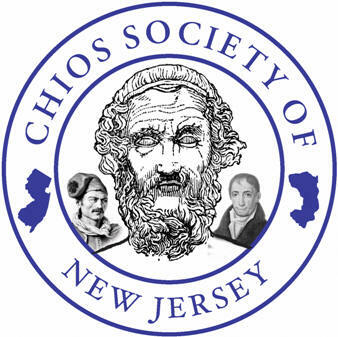 The essays will be judged by a team of professors at a college or university with credentials in the history of Chios chosen by the Eleftheria Centennial National Essay Contest Committee. 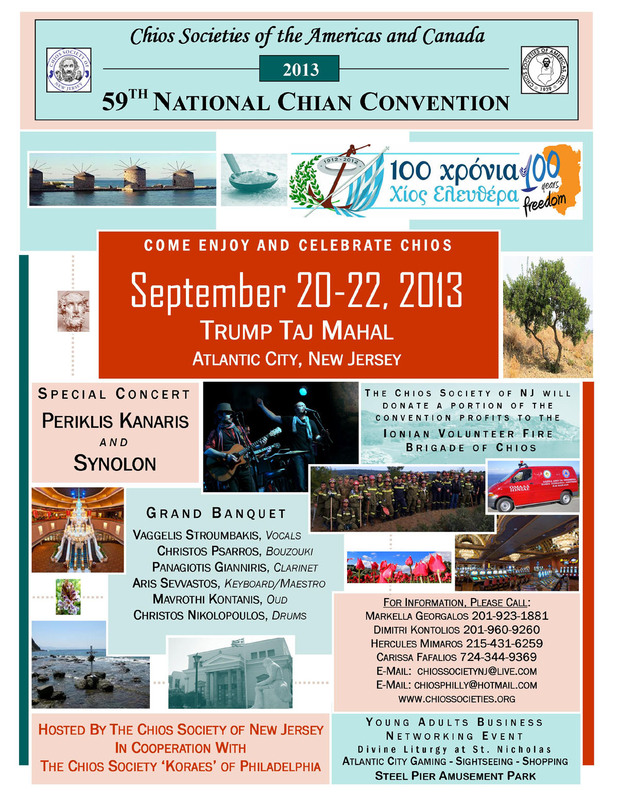 Thanks again to all of our members and friends for another successful convention last summer in Chios!!! 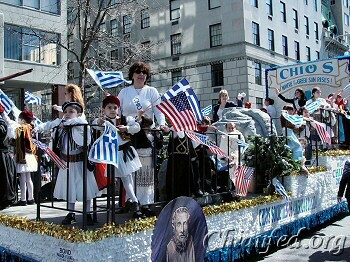 THE CHIOS SOCIETY OF THE GREATER WASHINGTON AREA has scheduled a Special Event in honor of the Chios Independence Day. 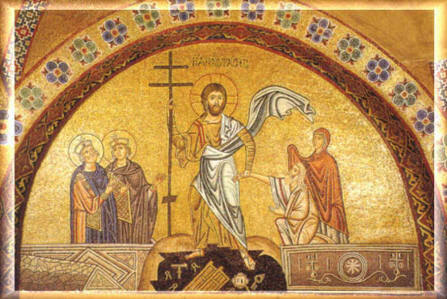 The Event will take place on Thursday, November 11, 2011, at the St. George Greek Orthodox Church in Bethesda, Maryland. Ο ΧΙΑΚΟΣ ΣΥΛΛΟΓΟΣ ΚΑΝΑΔΑ ΚΑΙ Ο ΣΥΛΛΟΓΟΣ ΘΟΛΟΠΟΤΑΜΙΩΝ "Ο ΑΓΙΟΣ ΠΕΤΡΟΣ", ΣΑΣ ΠΡΟΣΚΑΛΟΥΝ ΣΤΙΣ 14 ΝΟΕΜΒΡΙΟΥ ΣΤΙΣ ΕΟΡΤΑΣΤΙΚΕΣ ΕΚΔΗΛΩΣΕΙΣ ΓΙΑ ΤΗΝ ΑΠΕΛΕΥΘΕΡΩΣΗ ΤΗΣ ΧΙΟΥ ΑΠΟ ΤΟΝ ΤΟΥΡΚΙΚΟ ΖΥΓΟ. THANK YOU AGAIN TO THE CHIANS OF CALIFORNIA FOR ANOTHER WONDERFUL WEEKEND!!! ON THE OCCASION OF THE EUROPEAN WEEK CELEBRATIONS IN THE USA, THE EMBASSY OF GREECE AND THE CHIOS SOCIETIES OF AMERICA AND CANADA PRESENT A TRIBUTE TO ONE OF GREECE’S JEWELS, THE ISLAND OF CHIOS AND ITS UNIQUE CULTURE, HISTORY, NATURAL PRODUCTS AND MERCHANT MARINE SINCE ANTIQUITY. Presenters will travel from other US cities and directly from the island of Chios. The events will include lectures, video screenings, photography exhibits and tasting of mastiha. Visitors who would like to attend live music and dances from Chios should join us on May 8th from 10am-4pm, during the EU Open House, at the Embassy of Greece. All events of the Tribute to Chios will take place at the Embassy of Greece on May 10-12 and from 6:30pm-8:30pm. 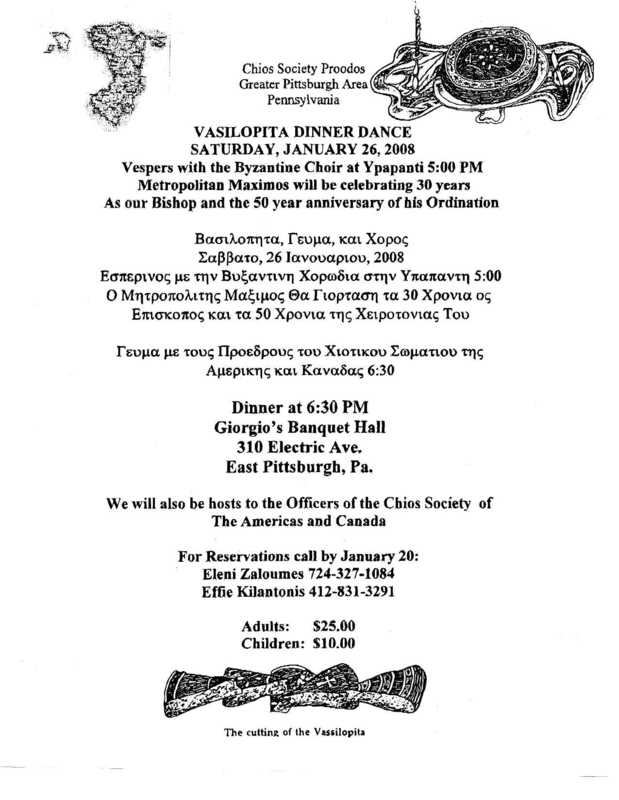 CHIOS SOCIETY “AGIA MARKELLA” WARREN, OHIO, ANNUAL DANCE, ST. DEMETRIOS COMMUNITY CENTER, 3223 ATLANTIC ST. WARREN, OHIO, SATURDAY MARCH 8TH, 9:00PM-????? Congratulations to the Chios Society "Agia Markella" Warren, Ohio, for their successful 1st Golf Outing on July 16, 2006, preceding their Annual Picnic. Enosis Omogenon Society, Summer Event in Chios, July 2006.